It has long been known and proven that omega-3 fatty acids play critical roles in the human diet. In particular, two omega-3 fatty acids found in fish oil, EPA (eicosapentaenoic acid) and DHA (docosahexaenoic acid) have been well researched. 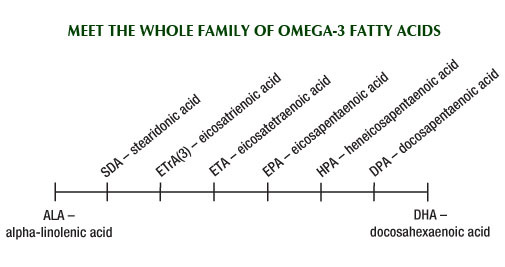 Today the latest scientific research not only continues to validate the important roles of EPA and DHA in human health, but it has also shown that there is a whole family of omega-3 fatty acids, a total of eight in all, which contribute to optimal human nutrition. This critically important chain of dietary omega-3 fatty acids starts with ALA (alpha linolenic acid) and ends with DHA (docosahexaenoic acid), taking six important steps along the way. Each is now known to have its own unique biochemistry and supporting “synergistic” role in human omega-3 nutrition. The United States Department of Agriculture suggests that all adults eat 2-3 servings of fish each week for optimal health. Unfortunately, the problem for many adults is that they eat very little fish on a consistent basis and rarely meet this important nutritional need. Large portions of the population go without getting any broad spectrum omega-3 supplementation for weeks, sometimes months. Not to mention the fact that much of the fish supply is suspect due to environmental contamination. Pregnant women, who have the highest dietary needs for omega-3 fatty acids, ironically are instructed to limit their fish intake to one serving per week, due to contamination risk. GNLD solves the problem of inadequate omega-3 fatty acid intake with Omega-3 Salmon Oil Plus. Pure and potent, Omega-3 Salmon Oil Plus provides a complete omega-3 profile of salmon oil with all eight members of the omega-3 fatty acid family, assuring complete omega-3 supplementation in every dose. Why supplement with fish oil rich in Omega-3 Fatty Acids? Fatty fish is the richest source of healthful omega-3 fatty acids, but most of us do not eat the 2-3 servings per week that experts recommend for optimal health. Supplementation has been proven to be an effective means of increasing dietary omega-3 fatty acids. Omega-3 fatty acids support optimal function of body tissues and organs, notably the heart, blood vessels, brain, nerves, eyes, skin and joints. Omega-3 fatty acids may prohibit overproduction of substances that cause inflammation and contribute to arthritis, menstrual pain, psoriasis, inflamed bowel and other conditions. Omega-3 fatty acids, crucial to the development of infant brain and eyes, are naturally present in mother’s milk. Infants, whose mothers consume foods rich in omega-3 fatty acids, have higher omega-3 fatty acid levels compared to those whose mothers do not consume omega-3-rich foods. Omega-3 fatty acids may slow ageing of the brain. Older adults who supplement their diets with EPA and DHA have demonstrated greater cognitive function when compared to those who don’t. Omega-3 fatty acids may prevent asthmatic mothers from passing it on to their offspring. People who do not like fish can get the omega-3 fatty acids they need for optimal health from fish oil supplements. 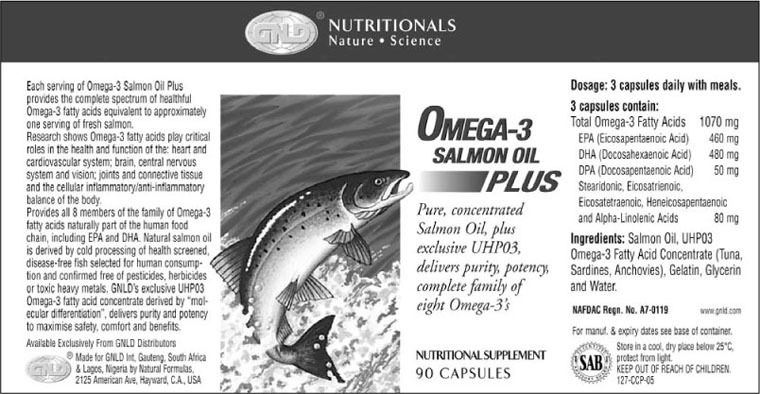 Why GNLD’s omega-3 Salmon Oil Plus? Omega-3 Salmon Oil Plus is based on pure, natural salmon oil, providing all the benefits of one of nature’s richest sources of omega-3 fatty acids. 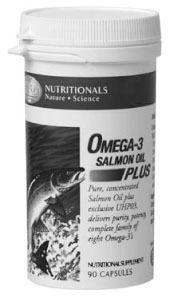 It includes UHPO3 - Ultra High Potency Omega-3 fatty acids- an exclusive GNLD technology that boosts, stabilizes, and standardizes specific, health-promoting omega-3 fatty acid levels while maintaining the whole food goodness of natural salmon oil. It’s derived by “molecular differentiation” - leading edge technology that selects specific nutrient molecules from tuna, sardines, and anchovies, while eliminating or reducing others, delivering unsurpassed potency, purity, and consistency. It’s safe, with no risk of accumulated toxins. Only the finest, top quality, health-screened, disease-free fish selected for human consumption are used. All sources are screened for more than 160 potential contaminants with an allowable detection limit of ZERO. Potency guaranteed to deliver 460 mg EPA, 480 mg DHA, 50 mg DPA, and 80 mg mixed omega-3 fatty acids with every 3-capsule serving. No hidden vitamins A or D.